Only 100k on the clock and 3 previous owners. 12 months MOT, petrol, CD/Radio, electrics. I have owned it nearly 2 years. Body good but alloys could do with a refurb. Piece of trim missing from roof rail, easy fix. VW Polo 1.2S 2002 3 door. Air con system fitted but has never worked while we have owned the car last 8/9 years. Has very slight leak from radiator, which has not affected use for daily commuting, just needed about ½ litre coolant top up once a month. For sale is my polo 1.4 16v. It has mot till feb next year. These cars are getting rare now, I have a folder full of history for this car, one on of the mots it has a different mileage, this is a mistake and shown in the history. VW polo 1.4 automatic DSG. This is my daughters car that she has owned for 18 months. It is well looked after. It's had 2 owners, it has 2 keys, a slight mark on the rear bumper drivers side. it has recently developed a fault with the gear box. DRIVERS SEAT DOES NOT FOLD FORWARD FOR ACCESS TO BACK. CENTRAL LOCKING ONLY WORKS FROM PASSENGER SIDE. MISS FIRE ON CYLINDER 3. NOT SO GOOD. Sold as spares or repairs, mot failure due to welding, engine and box all good, ALH engine code fits lots of VW, AUDI, SKODA ,SEAT. YOU KNOW WHO YOU ARE ! VW Polo S in silver, 5 door hatchback, in petrol. 1198CC 80133 miles. New exhaust fitted April. 1996 VW Polo. This car has been owned throughout its life by my Mother In Law who at the age of 84 has decided to stop driving. This would be a ideal first car and over the years has always started and run well. Battery is only a few months old and tyres have lots of tread still, 8 months still left on current MOT. This car still runs really well and has many more years left in it. For sale VW Polo 1.2 2006. It has air conditioning, electric windows, JVC handsfree stereo with bluetooth and USB. Features include; Air-Conditioning, Alloy Wheels, Electric Windows & Mirrors, etc. In good condition inside and out, no bodywork dents or dings - usual wear-and-tear for age. Regularly maintained. Average mileage (125658). Polo Twist 1.4 Petrol 2005 Silver. New break shoes and cylinders fitted this week. Sports alloy wheels with standard fit tyres. Two new rear tyres recently fitted. Would make an ideal first car. Plenty of maintenace proof receipts can be seen in owners handbook when viewing the car. Viewing possible Orpington / Bromley area. 5 speed manual. 4 good tyres. NO RESERVE! Cat S - rear bumper and passenger doors, fully repaired to factory standard. Full service book stamped history. Tyre condition Good. 16 Rivazza Alloys with 21545 R16 Tyres. 2 previous owners. Very well looked after car, in brilliant condition. DRIVES WELL. TO ALL THE PEOPLE WHO KEEP ASKING WHY THE CAR IS SOLD AS SEEN WITH NO WARRANTY NO WARRANTY. VOLKSWAGEN POLO 2008 / 58 reg TDI 1400cc, 5 DOOR. A ONE OWNER CAR TILL JAN THIS YEAR. Vw polo 1.2. Body work isnt mint does have a couple of marks around it that i have tried to picture best i can. I have priced this taking into account the minor faults. Drives really well. 3 previous owners. MOT - NEW so expires April 2020. Its 5 Doors In Black. price £2995 ovno. Would Make An Excellent First Car! Electric Windows and Central Locking. Great Condition VW Polo 1.4 TDI. Cheap To Run And Great On Fuel. Genuine Low Miles. 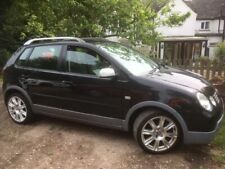 VW Polo 2007 automatic 1.4 petrol for sale. The car is in really good and clean condition. Few scraches on front bumper. One year MOT. Located at Weybridge KT13 0NT. Cash on collection. Wimborne Car Sales - Call us on 441202076856 or click here to find out more. Really good example with just 69,000 miles with Full Service History. We have here for sale a Volkswagen Polo S 1.2 from 2011. Body work, wheels and interior is in great condition with no scuffs or scratches due to the great care this car has received in its life. ELECTRIC WINDOWS/MIRRORS. VERY ECONOMICAL AND CHEAP TO RUN WOULD BE A GREAT FIRST CAR. VERY RARE TO FIND A CAR OF THIS AGE IN SUCH GOOD CONDITION AND VERY LOW MILEAGE. CAR RUNS AND DRIVES PERFECT. VW Polo Match Edition 1.2 2013 5 Door in grey 67909 on the clock. MOT April 2020.